“Until June 30, 2017, SBNs were received by the Reserve Bank either directly or from bank branches/post offices through the currency chest mechanism. Some of these SBNs are still lying in the currency chests. The value of the SBNs received by the currency chests has been credited to the banks’ account on “said to contain basis”. From the reports/data earlier published by RBI, currency in Rs.1,000 and Rs.500 denomination in circulation was at Rs.15.44 lakh crore. [6857.82 million notes of Rs.1000 and 17165.06 million notes of Rs.500 amounting separately to Rs. 685782 crore and Rs. 858253 crore]. Taking into consideration, the value of SBNs now reported to have been counted, approximately 98.96% of SBNs in value terms have come back to the RBI after demonetization. In other words, only an estimated Rs.16000 crore worth of SBNs have not come back to the RBI so far. The RBI’s Annual Report at page 125 under Chapter VIII - Currency Management, in Table VIII.1: informs that Rs.1,000 denomination banknotes in circulation were only 89 million pieces (value of Rs.8900 crore) as on 31st March, 2017. 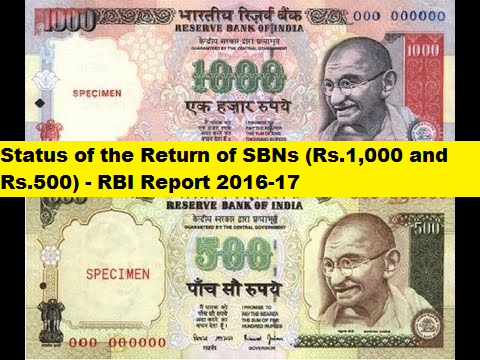 If these figures are subtracted from the total figure of Rs.16000 crore, then it implies that SBNs of Rs.7100 crore of Rs.500 denomination have not come back to RBI so far. Therefore, Rs.1,000 denomination of value of approx. Rs.8900 crore and Rs.500 denomination of value approx. Rs.7100 crore have not come back to RBI. As per RBI’s Annual Report at page 127 under Chapter VIII - Counterfeit Notes and Security Printing VIII.9 informs that during 2016-17, 762,072 pieces of counterfeit notes were detected in the banking system, of which 95.7 per cent were detected by commercial banks. Detection of counterfeit notes was 20.4 per cent higher than the previous year. Barring Rs.100, the detection of counterfeit notes increased across denominations – notably, Rs.500 and Rs.1000 – during 2016-17. The study done by RBI shows that the rate of FICN detected per million pieces of notes processed at the currency chest level at 7.1 pieces for Rs. 500 denomination and 19.1 pieces for Rs. 1000 denomination, which were higher than the rate of detection at the Reserve Bank (5.5 pieces for Rs. 500 and 12.4 pieces for Rs. 1000). At the Reserve Bank’s currency verification and processing system during 20156-16, there were 2.2 pieces of FICNs of Rs. 500 denomination and 5.8 pieces of FICNs of Rs. 1000 denomination for every million pieces of notes processed; which rose to 5.5 pieces and 12.4 pieces respectively during post demonetization period. Taking into consideration, the value of SBNs now reported to have been counted, approximately 98.96% of SBNs in value terms have come back to the RBI after demonetization. In other words, only an estimated Rs.16000 crore worth of SBNs have not come back to the RBI so far.